She certainly doesn't do things in halves! 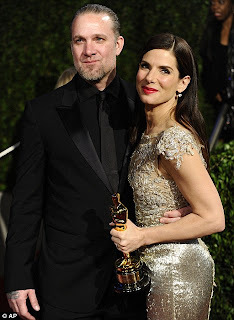 Sandra Bullock not only filed for divorce from her cheating husband, Jesse James, but she has shocked Hollywood by revealing she has an adopted son. How funny that art should imitate life. Sandra won an Oscar for her leading role in, The Blind Side, a true story about a mother who adopts a homeless African-American boy who becomes a successful football star. Sandra did an exclusive interview with People magazine talking about her decision to end her five year marriage, "I'm sad and I am scared." When asked about whether Jesse cheated on her she said she had, "no idea about anything." And added, "I did the only think I could do, and that was to pack enough clothes to live on, get all of Louis' things and get out of town. My main concern was Louis." Louis, is named after jazz artist Louis Armstrong. She said, He's just perfect, I can't even describe him any other way. All I said when I met him was 'Oh, there you are.' It was like he had always been a part of our lives." Jessie checked into a treatment facility to address, "personal issues" and he was spotted recently near his home without his wedding ring on. When she was asked about Jessie's parenting role with Louis she said, "I will be adopting as a single parent. Anything else will be taken day by day." Jessie told People magazine, "The decision to let my wife end our marriage and continue the adoption of Louis on her own, has been the hardest. The love I have for Louis cannot be put into words." Just when her career reaches its ultimate peak this happens. Good going Jesse! Well, I wish Sandra all the best. Although her marriage is over (sad face) at least she can say that a beautiful child has come out of such a awful situation (happy face). That child is georgous beyond words!